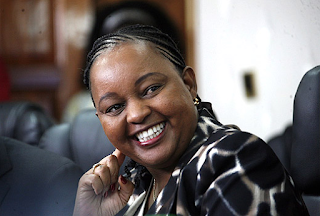 Former Devolution Cabinet Secretary Anne Waiguru on Wednesday morning sent out a congratulatory message to newly appointed Cabinet Secretaries. This comes just 3 days after the embattled minister announced her resignation on health grounds and asked the President to assign her lighter duties that he may deem fit. Although Kenyans view her resignations as something of an agreement between her and the president, Waiguru said that the pressure and attacks directed to her and her family caused her health to deteriorate and her doctor advised her to change jobs. Waiguru's ministry was confirmed to have lost Sh791 million in suspicious payments for the last one and a half years.